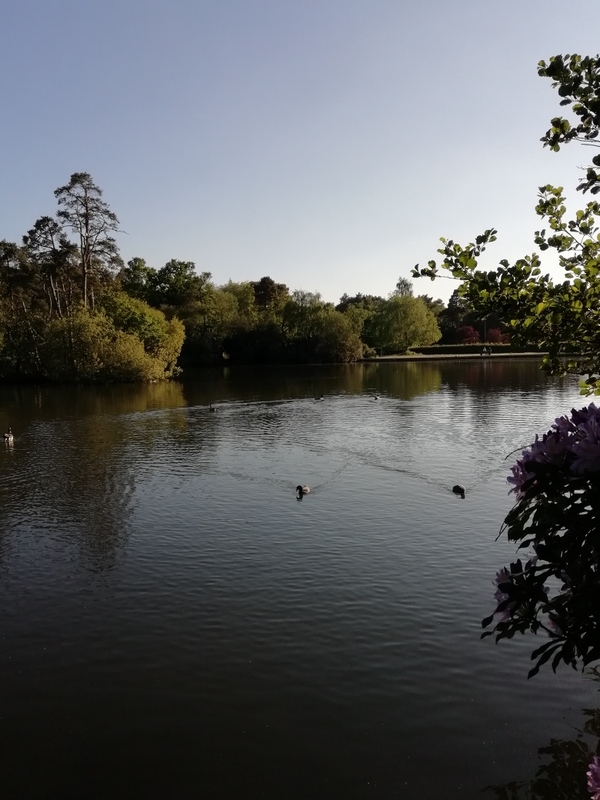 Bank holiday weekends are some of our busiest times throughout the holiday season and this Spring Bank Holiday was no exception. The weather was sunny, if a little stormy at times, great for those outdoor adventures and camping trips. Running a campervan hire company, we need to do our market research. 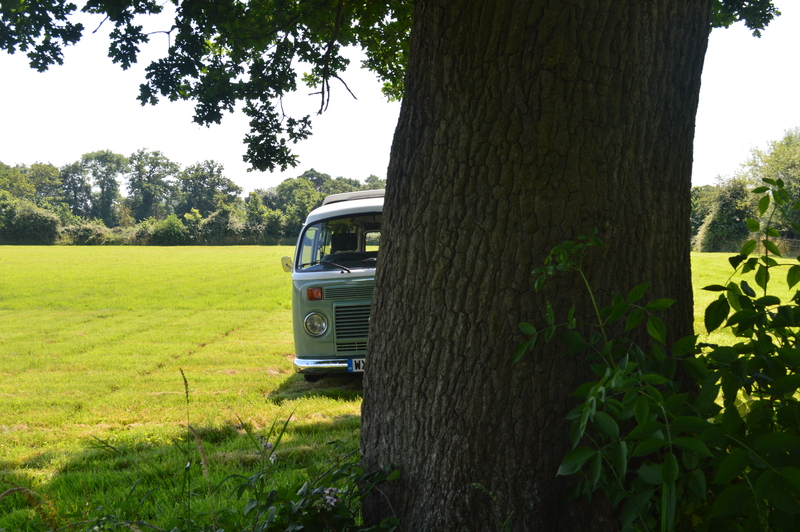 Not just with our vans but the types of campsite that you may want to visit. So, with all the vans off on their travels by 5pm Sunday evening and no-one due back until Monday afternoon, we grabbed a cheeky night out in our latest recruit – Edwina the Bongo! We took Edwina all the way to California! 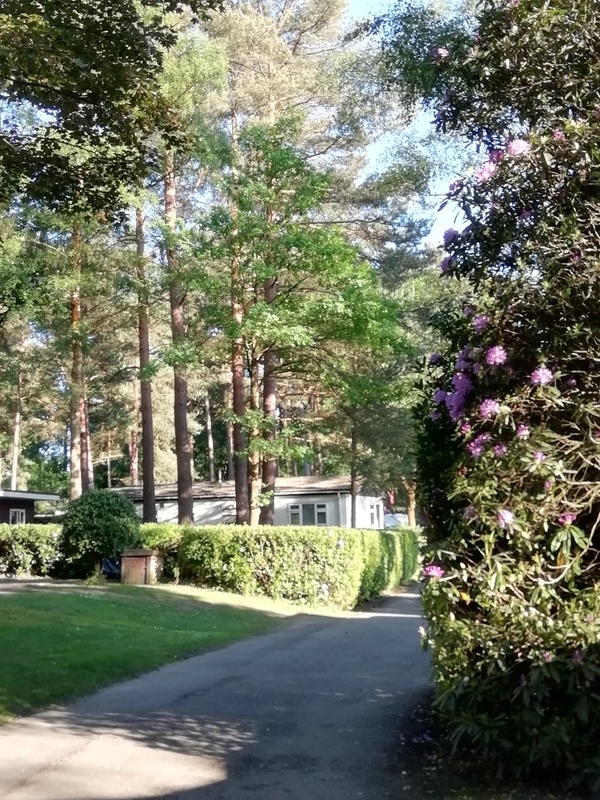 Well, California Chalet & Touring Park, just outside of Finchampstead, Berkshire. What a little gem of a campsite. They offer chalets and camping for everything from tents to RVs. The park originally formed part of Windsor Forest and was favourite hunting ground of the Tudors. It is now designated by the Countryside Commission as a Country Park. We rocked up at about 7pm, had a beautiful walk round the perimeter of the park, through lush, green lanes with hundreds of rhodedendrons. Back to Edwina to cook our tea. We decided to use the gas griddle outside as the weather was so balmy. Pork chops, tinned potatoes & sweetcorn, with apple. Not bad for an impromptu meal! A quick look at the emails – yes, we’re sad like that – work, work, work, but what an office 🙂 And so to bed. Edwina’s bed is amazingly easy to assemble. The seats go flat as in a normal car, out comes the bonquet and Voila! the bed. The great thing is, is that you can use the reclining seats to sit up and read in bed. We played cards and listened to the radio. Radio 2 in fact and we had a shout out from Suzi Perry! Fame at last! 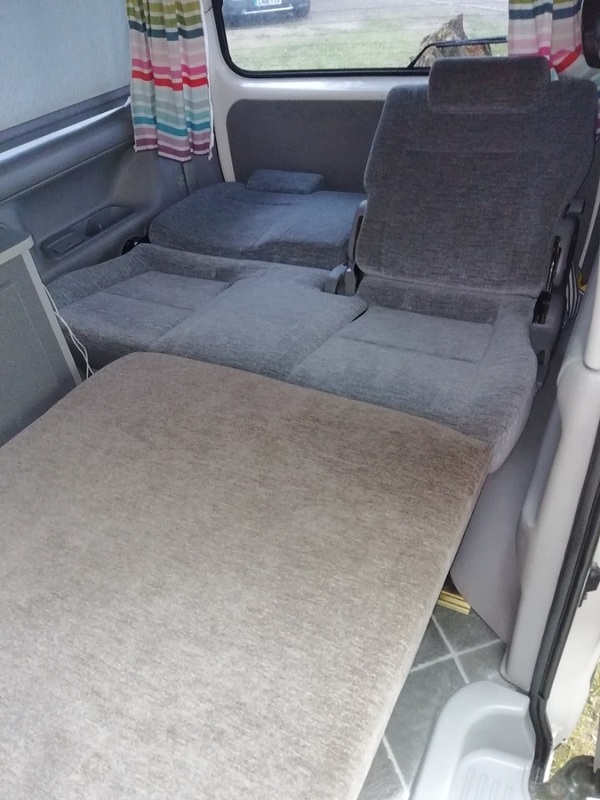 At last, a camper with power steering and automatic gearbox on our fleet. Edwina the Bongo is warm, comfortable and being an automatic, very easy to drive – she even has power steering – the only one on our fleet, so far. Breakfast of egg, bacon and tomatoes was cooked on the two ring gas hob. Washed down with lashings of tea. It took us less than 10 minutes to pack away. What a difference a day makes! It’s been such a long, cold, miserable Winter, hasn’t it? Don’t get us wrong, we love snow, but the cold & wet can do one now, we’ve had enough – humph! Saturday was a gorgeous day – it reminded us that if we’re patient, Spring will be sprung – eventually. The warmth in the air, that big yellow disk in the sky, the trees and bushes sprouting green shoots. Suddenly, the hedgerows are colourful instead of that dreary grey/brown. It makes you feel all warm and fluffy inside *sighs*. Winter is great to give Enzo and his pals, Boris, Otto, Sky, Freddie, Dylan and Matilda a rest, have a few check ups with Matt the mechanic and a spa day with Marcus the Masseur (valet to you and me). However, they are now ready to rock and roll! Depending on the size of your family, whether you’re taking the dog or whether you want heating – we have a van for you. 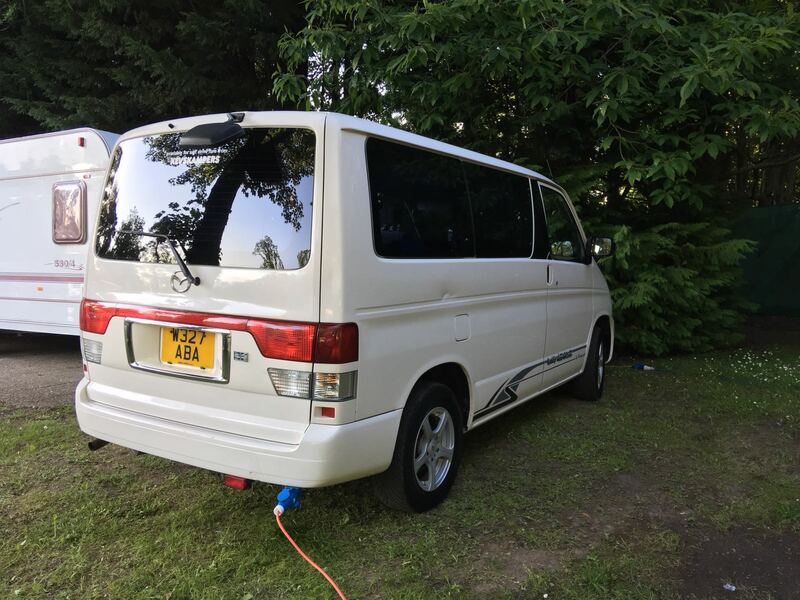 Check out their profiles at www.kevskampers.com and choose which campervan you would like to take for your camping holiday in Summer 2018. In fact, the sun must have gone to our heads – just for reading our blog we’ll give you a 10% discount if you quote the code #KKBLOG0418 – keep camping! Open for business at the new unit! Copyright © Kevs Kampers. All Rights Reserved.